ART IN A CORNER is endorsed by Paul McCartney and supported by Ringo Starr. Inspired by the only known painting ever made by The Beatles. Tokyo, 1966: The Beatles create Images of a Woman, the only painting they ever made. 50 years later, some of the biggest names in music - including Beach Boy Brian Wilson, Elvis Costello and The Bootleg Beatles - have followed in The Beatles footsteps to create their own versions of this unique piece of music history. The project is organised in support of Children & the Arts and Youth Music, two charities working with over 100,000 children and young people each year. Exclusive, limited edition prints and posters are available to order now via http://www.pledgemusic.com/projects/artinacorner with much more to come over the coming weeks. Exhibited artwork will also include archive photos of The Beatles’ 1966 tour of Japan by renowned British photographer Robert Whitaker. The only known painting The Beatles ever made, Images of a Woman’ was painted on tour in Japan, in 1966. It’s amazing to think that this incredible, abstract composition was painted by the ‘Fab Four’ simply to pass the time. The Beatles arrived in Tokyo ready to play three concerts at Budakon, Japan’s premier martial arts arena. Because of security fears for the band’s safety and protests against their intrusion into such an iconic Japanese institution, all four were kept on lockdown inside the Tokyo Hilton between shows. 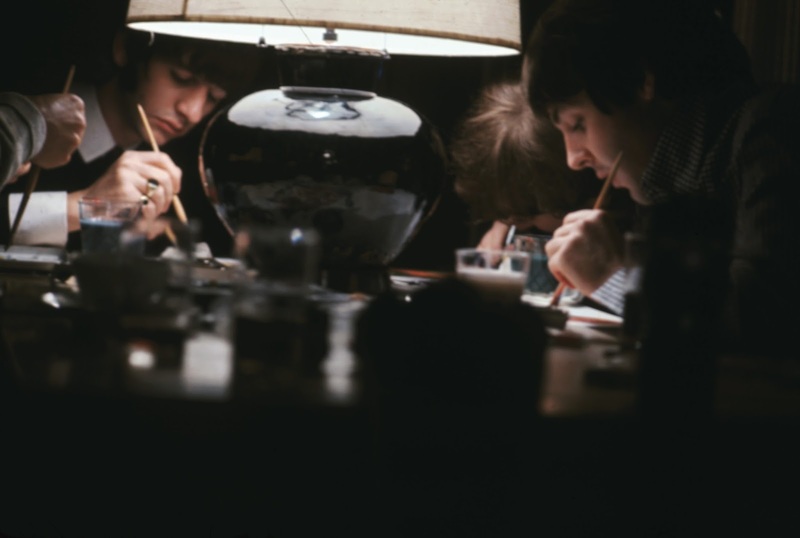 To keep them entertained, manager Brian Epstein brought in a set of art supplies, laid a large paper canvas on a table and placed a lamp in the centre. He then left four of the most famous men in the world to get creative. The Right Hand Lovers (aka Charlie Higson, Paul Whitehouse, Brian Pern (aka Simon Day) David Arnold & David Cummings.